If you’ve missed previous chances to catch the Legendary Pokemon Mewtwo, Articuno, Zapdos or Moltres in Pokemon Go, you’ve now got another chance. Over the past few months, Pokemon Go developers Niantic have been testing the Pokemon trainers across the world, setting goals for them through Professor Willow as part of what they’ve been calling the Global Research Challenge. This challenge has had numerous events available to fans both out in the real world at specific locations adn online for everyone to participate in – and over these months, fans have been able to earn the chance to catch very rare Pokemon. It’s fair to say that fans smashed expectations, with each stage of the research challenge quickly completed by Pokemon Go’s dedicated user-base. That means there’s one more reward to come: a chance for everyone to catch Mewtwo, as well as legendary birds Articuno, Zapdos and Moltres. These are super rare beasts that rate highly on our Pokemon Go tier list of the best Pokemon so they’re well worth having, and that’s not even the only bonus of this event. Region-exclusive Kanto Pokemon Farfetch’d, Kangaskhan, Mr. Mime and Tauros can now potentially hatch from 7km Pokemon Eggs, which are obtained through gifts from friends. Previously, the 7km eggs only contained the Alolan Pokemon forms. 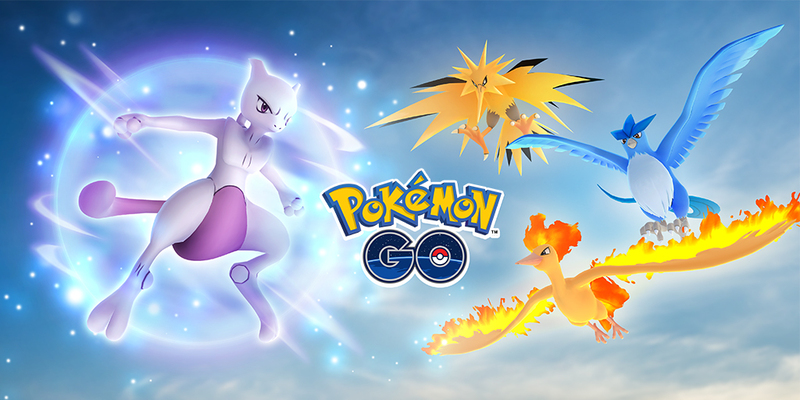 Articuno, Zapdos and Moltres will appear in regular Raid Battles across the world through September 20. This is a chance to catch these legendary Pokemon from the Kanto region (Pokemon Red/Blue/Green/Yellow) of the oriignal games. There’s even a chance that the Shiny forms of these Pokemon will appear in a raid near you, so keep an eye out. Finally, on September 20 (from 1pm Pacific), Mewtwo will appear in Raid Battles. Prior to this Mewtwo has only shown up as an EX Rade encounter, but now the ultra-rare genetically engineered Pokemon can show up as a part of raids. Mewtwo will replace Articuno, Zapdos and Moltres come September 20, so you’ll want to target catching those three Pokemon first. It isn’t currently clear for how long Mewtwo will stick around for, but the region-exclusive Pokemon will remain in 7km eggs through the end of September – so the end of the month seems like a safe bet at an absolute minimum.